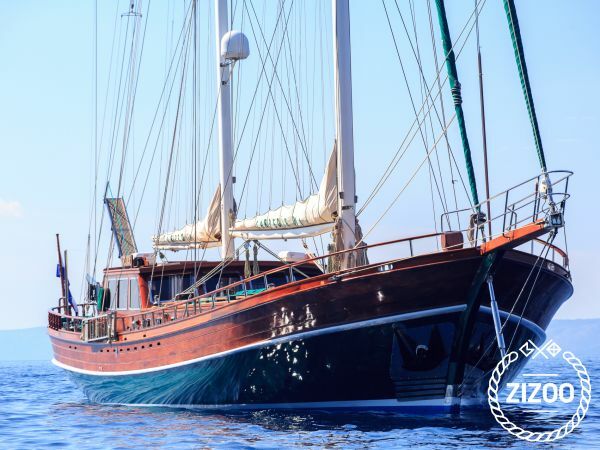 Carpe Diem 7 is Gulet built in Bodrum , Turkey and since May 2017 she is under Croatian flag . She’s classic style and beauty will charm you on first site. Marvellous wooden 30 m Gulet for only 8 guests will give you a glance of luxury and freedom. With experienced and professional Captain and his crew your vacation can not fail. You will experience beautiful Croatian coast in the most exciting and yet the most relaxed way. Gulet have 4 cabins for 8 guests. 1 master cabin, 1 double cabin and 2 twin cabins. All indoor space is air conditioned. Every cabin has a deposit box and toiletries. Spacious indoor salon, lot of sun deck provides possibility to decide whether to spend time with others or by yourself. It is ideal for families and friends. There are many water toys on board and toys such as Water skiing and Doughnut are included in the charter price! She has impressive rigging and set of sails capable to make a good sailing. It will be a pleasure to set a sails for you!